This wine is born from the grapes of the “Cetine” vineyards to the south of Montalcino where our Brunello Tenuta Nuova and our Rosso di Montalcino come from. 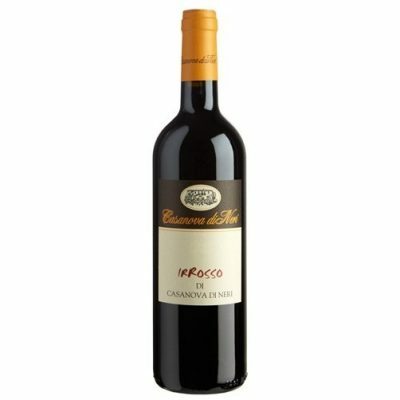 It is obtained from Sangiovese Grosso and Colorino grapes (the plants are reproductions of old varieties that we found in our oldest vineyards). We tried to produce a wine typical of our land and closely linked to it but with the style and characteristics of Casanova di Neri wines. It can be drunk at once or kept for some years giving even greater satisfaction.selection table for bunches, de-stemming, selection table for individual grapes. Vats filled by gravity. Fermentation without use of yeast additives and maceration in open conical vats at controlled temperatures for ¾ weeks Aged in oak barrels for around 15 months and 6 months in bottles.ntense ruby red, hints of wild cherry, violets and red fruits ample and easy to drink with excellent persistence.